When history is tied to the land, a natural partnership develops between land conservation and historic preservation. The Manor Area, with the My Lady’s Manor National Historic District as its centerpiece, is rich with landscapes, rural heritage, 18th and 19th century structures and lore. 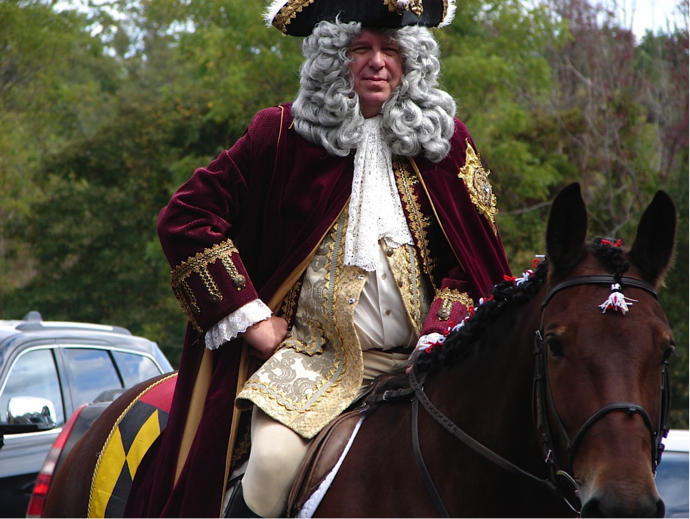 Descendants of early residents still live in the area and its history is entwined with first settlements, colonial times, the Revolutionary and Civil Wars and agricultural and natural resources mixed in with lively traditions of hunting, horse racing, jousting and the Maryland countryside. My Lady’s Manor, a 10,000-acre gift from Lord Baltimore to his wife in 1713. My Lady’s Manor is listed in the National Register of Historic Places and is recognized for its continued identity as a rural, agricultural, and historical treasure. Charles Calvert, the third Lord Baltimore, placed the 10,000 acre tract in reserve for himself in 1675. As an elderly man, he married his fourth wife and, in 1713, gave this Baltimore County land to his young wife, Margaret. In 1713, Charles Calvert, 3rd Lord of Baltimore, gave his 4th wife, Margaret Charleton of Hexham, the gift of 10,000 acres in what is now Baltimore and Harford County. These 10,000 acres, know as My Lady’s Manor, were eventually transferred from ownership from the Calvert Family and rule of British Crown to the veterans of the Revolutionary War and to former tenants at auction. 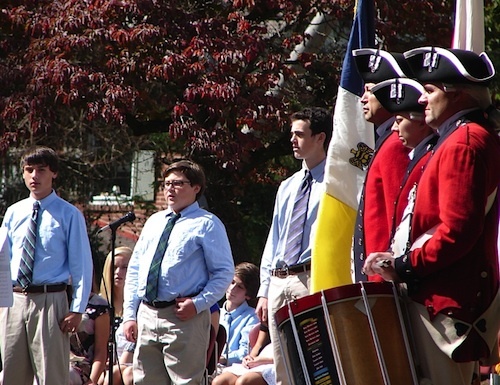 In 2013, The Manor Conservancy, with St. James Church and Academy, Manor 300 and The Society of Colonial Wars in the State of Maryland, celebrated the tercentennial anniversary of this gift. Representatives from Baltimore and Harford Counties, the State of Maryland, and the British Embassy, as well as the Old Guard of the White House and re-enactors in period costume, were in attendance. The Maryland Archives loaned the original 1713 Patent for a display in Saint James Academy for the event. Although the original 1713 Patent had to be returned within a few hours on Sunday, the letter that Christopher Sandamas, Private Secretary to the Queen of England, sent to commemorate the day is on display by the entrance to Macdonald Hall at Saint James Academy. 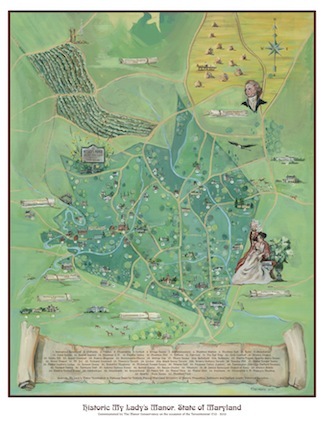 By Artist Betsy Herrmann, this commemorative print is 18 x 24 inches and depicts land grants in the Manor Area surrounding the 10,000 acres of "Lord Baltemore's Guift," with historic structures of the 18th and 19th centuries and other landmarks. Commissioned on the occasion of the 300th anniversary of the Deeding of My Lady's Manor, the prints are limited to 250. Proceeds from sales will be contributed to the Iglehart Fund, a revolving fund to be used as a reserve towards the purchase of farms in danger of subdivision. The village of Monkton was originally known as Charlotte Town. Charlotte was the sister of the fifth Lord of Baltimore. In 1744, Thomas Brerewood, who was then the owner of the manor, established the town “for the increase of the trade and commerce,” as he wrote leases for the artisans who were to build and serve My Lady’s Manor. Robert Cummins, who purchased a small estate, including the mill on the west bank of the Gunpowder, changed the name of the town to Monkton Mills in 1771. Cummins had earlier settled in Nova Scotia in a town named for the British Colonel Robert Monckton and brought the name to Maryland. The local community dropped the “c” at the turn of the 19th century. Legend has it that Gunpowder got its name as early as 1600 when Native Americans attempted to plant gunpowder with the hopes that it would produce a crop. 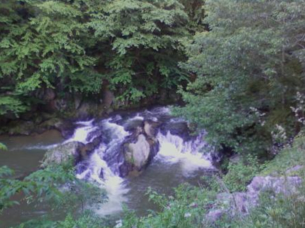 Big Gunpowder Falls originates in Southern York County, Pennsylvania and is joined by the Little Gunpowder at the western border of Harford County and the eastern border of North Baltimore County, in the heart of My Lady’s Manor. It and its numerous tributaries runt through agricultural and forested land in the area, forming a major watershed to the Chesapeake Bay. Gunpowder River supports a vibrant trout population and serves as a popular local recreational destination for fishing, kayaking, and tubing. At two points, the river is dammed, to form Prettyboy and Lock Raven reservoirs, both important water sources for the Baltimore metropolitan area. From 1838 to 1972, the Northern Central Railroad (NCR) connected Harrisburg and York Pennsylvania to Baltimore. The NCR was important for commerce, but also was vital to the movement of troops during the Civil War. In fact, the funeral train bearing the casket of Abraham Lincoln was drawn along these tracks by an engine draped in black crepe. 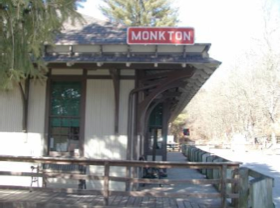 The Monkton and Parkton stations were built around 1840 and were later replaced with fancier structures at the turn of the century. The town of Parkton was the terminus of the local commuter trains and place where local farmers bringing produce had to pay a toll. The abandoned line became the Torrey C. Brown trail, one of the first rails to trails projects in the United States. The trail is managed by the Department of Natural Resources (DNR). 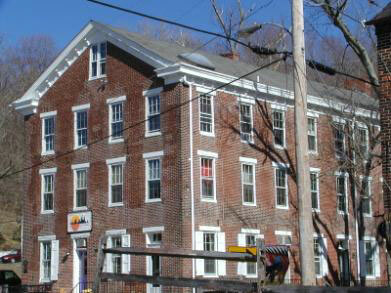 Many of the residences of Corbett Village were built in 1880 along with a steam saw mill and a General Store. The town was named for Isaac Corbitt who sold the land for the Corbett station to the railroad at the time of the Civil War. The land around Corbett adjoins My Lady’s Manor and was patented in the 18th century as Cromwell’s Park. The frame houses in Corbett Historic District are characteristic Victorian. Saint James Episcopal Church is a well-known and beloved landmark in My Lady’s Manor. 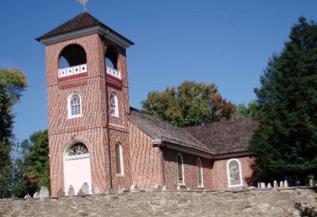 Built in the 1750s, it is the first church building erected in Baltimore County, north of Cockeysville, and it stands today much as it then. 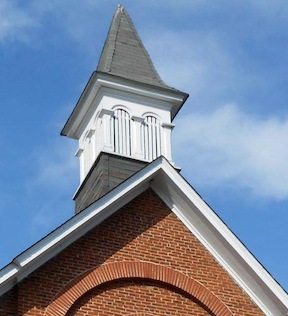 The church is listed in the National Registry of Historic Places. The Episcopal parish of Saint James of Joppa gathered subscriptions to build the first portion of what they called a “Chapel of Ease” between the forks of the Gunpowder. The church was completed in 1755 and was enlarged in 1761. The bell tower dates from 1884. Each Thanksgiving, since 1929, the Elkridge-Harford Hunt Club meets at the church for the traditional Blessing of the Hounds and a celebration of the land and its bounty. Joshua Hutchins Cockey wrote a history of Saint James from covering the years from 1750 to 2000. The Elkridge-Harford Hunt Club History by J. Rieman McIntosh and Michael J. Davies provides abundant information and wonderful photographs. It is a reference for the following summary. 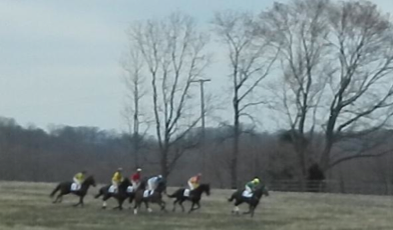 The Elkridge Fox Hunting Club was incorporated in 1878. The club was the likely descendant of the Baltimore Hunt Club, one of the first organized fox hunting groups in colonial America. The club’s kennels moved from various locations in Baltimore City to the Charles Street location of Governor Bradford’s property (Montevideo Park). In 1920, the kennels moved to Long Quarter Farm at Pot Spring Road in Dulaney Valley, property purchased from Mrs. Howard Ridgely. During the 1920s, boundaries were established to separate the hunt country of the Elkridge Club from the adjacent Greenspring and Harford Hunt Clubs. 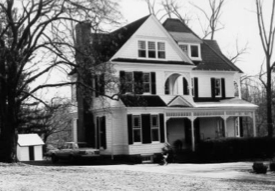 Hounds were kept at Farmington, home of John Rush Streett, and in 1927, the club purchased the current property along with 411 acres. The clubhouse was rebuilt after a fire in 1938. 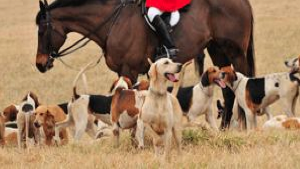 In 1934, the Elkridge Hounds and the Harford Hunt (which had been incorporated in 1915) consolidated. This new partnership was forged in the midst of the depression during a time when rural land was being lost to housing growth. The hunt country in Harford and Northern Baltimore counties totals approximately 120 square miles and is rolling farmland with wooded areas and pastures. There are over 25,000 contiguous acres in two areas of the hunt country in which conservation easements prohibit or severely limit development. Harvey S. Ladew (1887-1976) purchased Pleasant Valley Farm in Harford County, property adjacent to the Elkridge-Harford Hunt Club, in 1929. He was a bon vivant, an artist, a traveler, and the creator of Ladew Gardens, a topiary masterpiece, which opened to the public in 1971. Christopher Weeks wrote an engaging biography of Ladew called Perfectly Delightful: The Life and Gardens of Harvey Ladew. Information about Ladew Gardens, called “the most outstanding topiary garden in America” with its circa-1747 Manor House, 22 acres of garden and nature walk can be found at Ladew History. My Lady’s Manor Point to Point was first run by that name in 1909 “part and parcel of a popular local tradition dating from the early settlers to present day.” The race was originally run on the Pearce property in the heart of the Manor before moving to the grounds of the Elkridge-Harford Hunt at Pocock Road and Jarrettsville Pike. 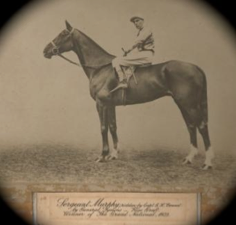 The history, My Lady’s Manor Races 1909-2009 by Margaret Worrall, is a fine reference, providing insight to 100 years of local racing tradition. Another wonderful resource is Maryland Steeplechasing (Image of America) by Christianna McCausland, which contains a wonderful artist’s rendering of the older My Lady’s Manor course run over properties then owned by the Secor, Pearce, Riggs and Warfield families in Monkton. 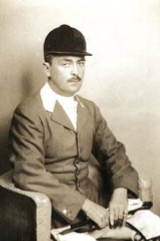 The Sergeant Murphy Point to Point was held from 1925 to 1934 as part of the Harford Hunt Races on the grounds of Pleasant Valley Farm,home of Henry Ladew. The historic trophy cup from the race, donated to The Manor Conservancy by the Sanford family, has found new life as an award to recognize individuals who put forth exceptional efforts to preserve land in Harford and Northern Baltimore Counties. More on its history here. White Hall in Baltimore and Harford Counties was not named after the London Palace or the British governmental area, as some may believe. White Hall got its name from a large white house that was built near the tracks of the North Central Railroad early in the 1800s. 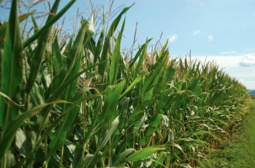 Other old towns in this beautiful agricultural area include Stablersville, which was named for the Stabler family whose grist and sawmill were important to the area. Another town, Vernon, was called, in the past, Mount Vernon, Moore’s Crossroads, and Gemmill’s (after a local storekeeper). Nearby are “Almony’s Neglect,” patented by James Almony in 1752 and “Gillis’s Garden,” claimed by Robert Gillis, a few years later. Source: From Marble Hill to Maryland Line, an Informal History of Northern Baltimore County by S.B. Clements and C.E. Clemens. 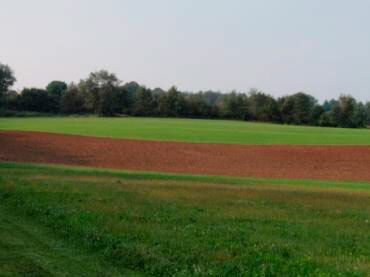 The Manor Conservancy’s Rural Legacy area extends across the Baltimore and Harford County boundaries to augment a large block of lands preserved through the Maryland Environmental Trust (MET) and Maryland Agricultural Easements. Clynmalira is a tract of 5,000 acres that was patented in the 1700s by Charles Carroll, who was Lord Baltimore’s Attorney General. The name is Gaelic, reputed to be named after the ancient Carroll estate in Ireland. The manor house on Carroll Road retains the name along with Clynmalira Methodist Church on Old York Road, which was also known as Pearce’s Meeting when it began prior to 1845. The Manor Conservancy Rural Legacy Area extends into the Clynmalira tract. The cornerstone of this church, built on the hill in the village of Monkton, was laid in 1870. The church housed one of the many Methodist congregations meeting in the area who were served by visiting circuit rider preachers. The location on the village hill was likely chosen because the worshipers wanted a home church in the village and the high location lay above the difficult dirt roads, often flooded. Other early Methodist groups included Hereford, Wesley Chapel (originally known as Shaw’s Meeting), Stablers (with a date stone of 1814) and White Hall. Located in the heart of the Manor Area is an 18th century ruin know as the Fugate House. The Manor Conservancy commissioned study of the site and production of the book: The Fugate House: An Investigation into the History of A Stone Run in My Lady’s Manor. As one of the oldest structures in the area, the site is important to colonial as well as the African-American history of the area. Additional aspirations of the Conservancy’s Fugate project are to stabilize and potentially restore the ruin so that it can be used as a historic, scenic, and educational resource in its original rural setting. Contact us at info@themanorconservancy for information about the book and the restoration project. News of its progress will be posted on the website.